If you’ve heard great things about N-Central by N-Able, you’re probably wondering why the company makes its website so difficult to find. The reason is that N-Able doesn’t exist anymore. So, you want an alternative to N-Central. You’ve come to the right place because we have ten strong contenders that will fulfill all of the functions that you could have gotten from N-Able’s N-Central. The target client base for N-Central was Managed Service Providers (MSPs). The core of the service is a Remote Monitoring and Management platform (RMM). The N-Central system could be downloaded and installed onsite or used as a Software-as-a-Service (SaaS) model. N-Able also offered an Endpoint Security Manager to enhance the patch status of each customer endpoint and assist MSPs to roll out new software versions effortlessly. The company made that additional service available to its N-Central customers for free for a year. The N-Central console enabled multiple operators to support multiple clients. The team manager could reallocate staff between client projects without having to install new software or change the console settings. That capability also meant that support staff could be shared between projects. Each project-set gets ‘operatives’ access to every user endpoint, network device, and server on the customer’s network. The N-Central package also included task automation and troubleshooting wizards tool which help staff solve problems faster. The reporting module of the package included SLA goal reporting, and other performance monitoring formats. N-Able had a lot of success with N-Central and kept developing it in newer releases to improve the system year-by-year. The company didn’t go out of business. Instead, the success of N-Central made the company an attractive acquisition and it was bought by SolarWinds. You can still buy this RMM package, only now you need to look for SolarWinds N-Central. SolarWinds N-Central 12.0 is now available. The backing of SolarWinds gives this tool great customer support, which was something that some users of N-Central felt was lacking when the system was provided by N-Able. SolarWinds is a large network tools provider with a wide range of products. Its MSP division was able to evolve N-Central into a world-beating RMM tool that is enhanced by other companion tools produced by the company. This latest version of N-Central is designed to assist MSP and also corporate IT departments that manage remote sites from a central location. The tool can cover on premises, Cloud, and hybrid networks. The tool is scalable, which allows the support of small and middle-sized enterprises, as well as large corporations. SolarWinds integrated some of its key network monitoring tools from its existing stable of network utilities into N-Central 12.0. These give operatives a view on the live statuses of all of the links and services that deliver apps to end users. These include Web services, Microsoft Office 365 applications, such as email, and on-premises applications. 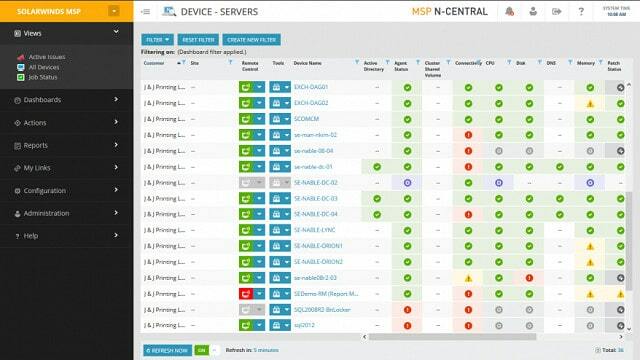 Customers can get the performance of their in-house IT infrastructure and their systems delivered to their own customers monitored by MSPs using N-Central. The key monitoring tool that SolarWinds added to N-Central is called NetPath. This shows all of the network elements and services that contribute to the delivery of an application to each end user. The performance of each element contributing to the end user experience is shown live; so support staff can see instantly if delivery is impaired and which network service is the cause of performance issues. N-Able’s Endpoint Security Manager is still available as part of the SolarWinds N-Central package. This feature focuses on patch management and gives a managed service provider the ability to keep tabs on the versions of all applications, services, and operating systems operating within the client’s environment. 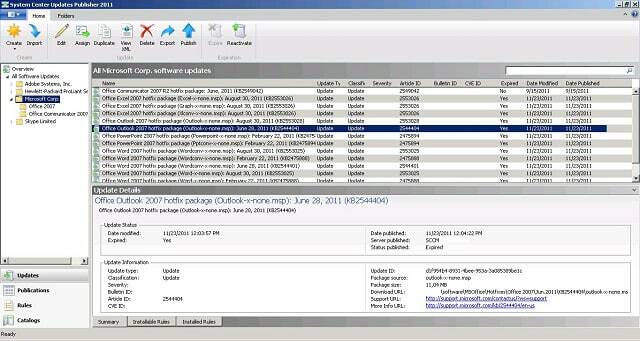 The central console polls software providers for updates. The IT center manager can decide whether all patches should be rolled out automatically, or managed on demand. The list of available patches is searchable, which lets service managers highlight and prioritize patches to essential software. Patch updates can be scheduled to take place away from peak traffic and usage times. The scheduler of N-Central includes process automation that includes rollback and error notification if updates go wrong. The patch manager, together with other schedulers in the system, record when individual nodes are offline or display some other condition that prevented update. This is a great help that enables you to leave the patch management process unmonitored in out-of-office-hours execution. Other solutions to the problem of offline equipment that are possible with N-Central include the queuing of tasks to be performed when that dormant piece of equipment next powers up. The SolarWinds N-Central package can integrate with other SolarWinds tools, such as its MSP Manager and Help Desk Manager. This integration creates information flow that enable the automation of task Help Desk ticket raising, task assignment, and performance oversight. All of these information flows also direct statistics towards billing modules. If you prefer to use the Help Desk services provided by other software houses, APIs within N-Central will pass data to, and receive information from, a range of commonly-used tools, such as Autotask, Tigerpaw, and ConnectWise. This connectivity means that operatives can perform all of their tasks from within the N-Central dashboard. If you employ other Help Desk applications, then the first line support staff will only need to use your designated Help Desk system. Task scheduling gets flowed through to back office staff who are supported by N-Central. Other administrative conveniences built into N-Central include a Single Sign On (SSO) mechanism that runs off Google G Suite accounts through the OpenID Connect protocol. SolarWinds N-Central doesn’t require an operating system. You install it on a bare server because a CentOS implementation is embedded within the package. Your host for this software does need to be Red Hat-certified. Some elements of the N-Central package require a separate host running Windows or Windows Server. One example of this requirement is the NetPath module. SolarWinds offers a 30-day free trial of N-Central. Even though you now know that N-Central does still exist, you might be interested in exploring other RMM software. All of the alternatives to N-Central that we have researched are free to use or offer you a free trial. The next section of this guide gives you details of each of these alternatives. By continuing the service life of N-Central SolarWinds actually ensured the longevity of one of the rivals to its own RMM tool. This is the leading alternative to SolarWinds N-Central and it is the number one option detailed in your list below. However, we give you descriptions of nine other RMM tools that would work as an alternative to N-Central. Paessler’s network monitoring strategy is unique. While other software houses produce specialized modules, Paessler markets one sole product, which is PRTG. The package contains a large number of sensors. A sensor monitors one specific aspect of infrastructure or performs a service, such as Ping. The system is capable of monitoring networks, servers, and applications. However, you can tailor the tool by choosing the number of sensors to activate. The system is completely free to use if you only activate up to 100 sensors. PRTG can be deployed as an RMM tool. The premise of this application of PRTG is that it can monitor networks, endpoints, network devices, operating systems, and software for a WAN from a central location. On that basis, it works perfectly well for MSPs to administer several sites on behalf of clients. 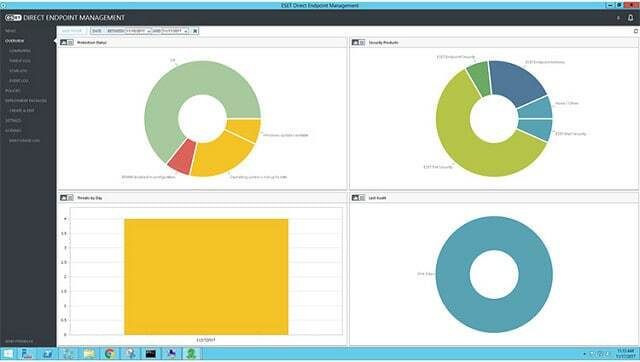 Although the PRTG strategy is one of applying a general WAN monitoring tool to MSP scenarios, the package does include tailored dashboards and account management. This allows you to allocate different capabilities to different team members. One weakness of PRTG for MSPs is that it is purely a monitoring tool. 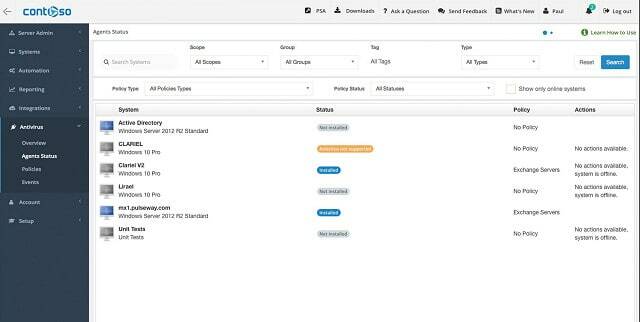 Although those monitoring functions are very comprehensive, the PRTG system doesn’t include any infrastructure management functions, such as Help Desk ticketing or patch management. PRTG would probably be better suited to a corporate IT center that operates as a cost center rather than to outright independent MSPs. The tool has excellent mapping and tracking capabilities, which enables you to manage traffic for your customers. The capabilities of PRTG extend into Cloud and wireless network elements as well. Paessler offer PRTG as on-premises software and also as a Cloud service. The rate you pay for the tool depends on how many sensors you want to activate. The company runs a free trial for new customers and that extends to both formats. The software installs on Windows Server and even if you opt for the Cloud-based service, you will still need to install data collectors on your own system which require Windows Server. The free trial gives you unlimited sensors. You can download PRTG on a 30-day free trial. The trial stops working on its expiry date but you will not be charged after that date. SolarWinds RMM is part of a series of remote support assistants produced by the company. The other MSP-oriented tools that SolarWinds produces are MSP Manager, SolarWinds Backup, SolarWinds Mail Assure, SolarWinds Risk Intelligence, and SolarWinds Take Control. All of these tools are designed to work together with the RMM module, although they are sold separately. The SolarWinds MSP module that most directly maps onto the functionality of N-Central is the SolarWinds RMM. The company set up two rival RMM packages when it took on N-Central. Its other MSP tools are also able to interact with N-Central, so if you choose to get all of your MSP software from SolarWinds, you have two options when choosing software to cover RMM. The main features of this tool are very similar to those available with SolarWinds N-Central. The system enables you to manage the assets of clients on remote sites, both through direct contact and through automated procedures. Patch management and antivirus update coordination are very strong elements of SolarWinds RMM. The addition of the company’s Risk Intelligence module will greatly enhance the security features of this tool, which include malware protection and website protection. The system also guards against the possibility of infected websites being used as an entry point to the network. The tool is able to monitor a wide range of devices and can also detect and track the supporting services for virtualizations. The combination of functions built into the RMM enable operatives to keep track of system conditions on client sites from one console. 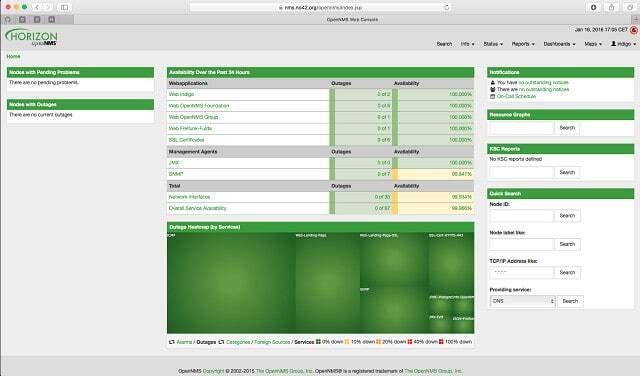 The dashboard includes automation features, such as drag-and-drop activity allocations. The reports that ship with the package will also help you monitor the performance of your staff as well as the conditions of the client’s site. With a combination of the reports of the RMM tool and its dashboard utilities, your team will be better able to identify security and performance threats to your clients’ systems and head them off before they cause damage. The simplicity of the RMM’s interface is one of this tool’s strengths because it enables support staff to get to the most frequently-used tools quickly. SolarWinds offers a 30-day free trial of its RMM package. You don’t need to present any payment details in order to receive this offer; therefore, there is no risk at all to trying it. Although PRTG has a free version and both SolarWinds RMM solutions can be had on a free trial, none of those options were planned as free services from the ground up. OpenRMS is an open source project, hosted by Sourceforge. You can just download the programming code and install the package for free. Being a free non-commercial project, OpenRMS isn’t as sophisticated as the top options in this guide and you don’t get any technical support from the company – because there is no company. However, having access to the source code means that you can be sure that there are no hidden tricks. Also, if you have programming resources available to you, there is also the option of customizing the code to get the perfect RMM solution for your organization. The core of the OpenRMS system is a remote access monitoring service. Plugins to the central module allow all the capabilities to monitor wireless networks and even IoT devices. The system includes agent software that gets installed on the remote equipment. This communicates with a server module, which provides the command center. The types of tasks that these facilities can perform include path distribution, user credential management, and status reporting. The software for OpenRSM can be installed on both Windows and Linux operating systems. There are also agents that operate on embedded systems. If you operate virtualization on your network, or on client sites, the OpenRSM service can manage these services for you. It can also bypass the VM environment whenever queries to the underlying hardware and operating systems are required. The reporting module of OpenRSM offers the option to create your own reports. The program doesn’t ship with many pre-written report formats and it isn’t specifically designed to serve as an SLA compliance reporter, so you need to set up those categories of reports for yourself. If you are not attracted to the “cookie cutter” solutions offered by the big software houses, then a customizable open source option could be what you are looking for. This software does need work. However, it is completely free to use. OpenNMS offers you another free, open source RMM options. This system has a different production format to that of the volunteer-driven OpenRMS. The OpenNMS service is open source and anyone can read the code. However, this is a commercial product and is copyrighted. There is a paid version of OpenNMS as well. The free OpenNMS is called Horizon and the paid version is called Meridian. The Meridian version has more features and is subjected to more vigorous software testing than Horizon. It has technical support, including the release of more regular updates and bug fixes than are available for the free version. Both versions do coordinate over time through updates. Bug discovery and fixes for Horizon are generated by a user community, whereas a dedicated staff monitors the code for the paid version. So, bug alerts and innovations spotted or created by users eventually get integrated into the paid version, but only once the code is judged to be stable. Basically, by using Horizon, you get the beta version of Meridian. NMS stands for “Network Monitoring System.” This is a traffic monitor that can be applied to WAN support and so would also be suitable for managed service providers to check on the activities of client networks. 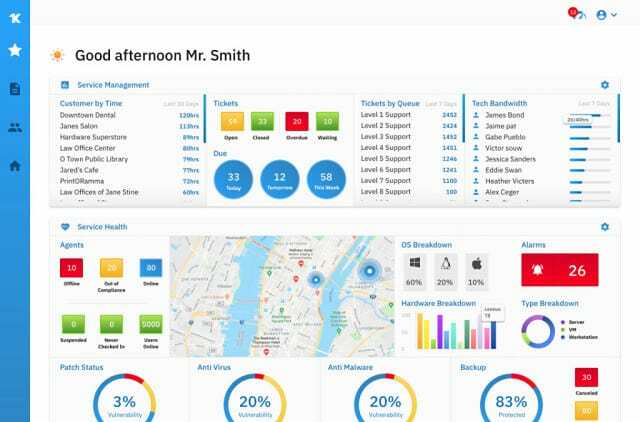 The company behind this service is constantly improving the visualizations that the management module provides in its dashboard. However, the back end remains the same and that is primarily an SNMP-based service. This is a solution for MSPs that monitor network performance and have contracts that revolve around the continual availability of network devices. There aren’t any problem resolution modules included in the package; however, remote access facilities could be used to check on configurations and also to roll out patches. This is a monitoring system that would be better suited to a back office system for the IT department of a medium-sized enterprise. Nagios Core is a free open source network monitoring system. The tool can be extended endlessly by plugins. You can either write your own plugins or get them from the user community. The tool has a very wide user base and there are even other network management systems that are adaptations of Nagios Core. The users of Nagios communicate through a forum and offer their extensions to the basic system for free. You can pick up extensions that will make Nagios Core a great RMM tool to rival N-Central. The basic Nagios Core doesn’t include an interface, but you can browse front ends that are available for free in the user community. The Core package is very widely liked for its flexibility, but its native monitoring messaging standard can overload the system of a large network with extra traffic. However, you can adjust that by including an SNMP monitoring plugin and relying on that protocol instead of the Core monitoring system. Nagios Core is able to operate on and monitor both Windows and Linux hosts. The system can monitor servers and applications as well as network equipment. The tool can also be set up to focus on Web applications. An additional free Nagios project, called Nagios Fusion, links different sites together. So if you used Nagios to monitor client sites, you would probably end up installing Nagios Core on each client site and then administering them all remotely from your HQ though this linking system. If you want a more sophisticated front end to Nagios and you can’t be bothered to look around all for the community pages for guidance and additions, you can opt for Nagios XI, which is a full infrastructure monitoring system, with an attractive interface and technical support included. Nagios XI has full multi-tenant features, which would make it a quicker solution to set up for MSPs than Nagios Core. You can get the full version of Nagios XI on a 60-day free trial. Comodo One is a free RMM platform. The security aspects of the management software are paid. However, the basic RMM system is free. Comodo specializes in cybersecurity, so its One platform enables it to sell a range of its security features into an integrated, single access point. The system is able to monitor LANs, Cloud-based services, and hybrid systems. It is particularly strong at protecting Web applications. The key module of Comodo One for MSPs is Comodo Remote Monitoring and Management (CRMM). The main elements of this service are endpoint access, remote desktop sharing Professional Services Automation (PSA) – which means ticketing, task allocation, policy enforcement, and logging. The central console provides one end of the communication tunnel between you and your client sites. The other element is an agent program, which needs to be installed at each remote endpoint. The agent software can be installed remotely when enrolling assets into your service plan. 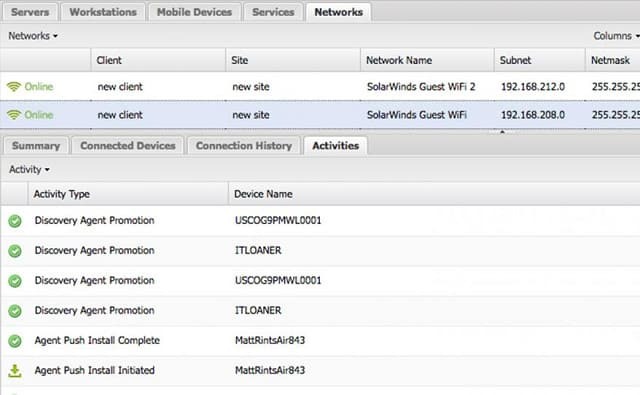 Once a site has been connected through its gateway, the network monitor built into the EMM package will automatically seek out and log all of the assets on that network. 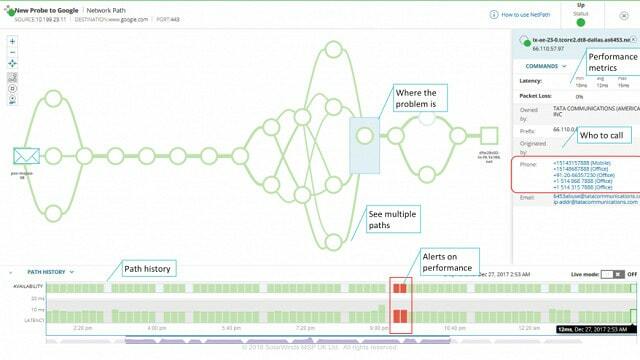 As well as monitoring network, server, and application performance, the Comodo system will constantly monitor for risks to the network, with 18 different tests to detect for security weaknesses. With the RMM connection established, you then get the option to add on other Comodo services, such as edge security for web servers that include DDoS protection and DNS services. The console also gives access to a task manager for support staff leaders and a patch manager for the systems administrator. You can also add on Cloud data backup services to your tariff. The RMM service is Cloud-based, but it is capable of monitoring on-site assets that run on Windows, Linux, and Mac OS. The service can also be extended to mobile device management and software distribution. The prospects of getting a free RMM from a reputable source like Comodo seem too good to be true. However, be aware that you will have to pay for some modules in order to assemble a complete MSP support IT system. Microsoft System Center Configuration Manager is a Windows-based tool that is capable of monitoring computers that have Windows, Linux, Unix, and Mac OS operating systems. It can also manage mobile devices running Windows Phone, iOS, Android, and Symbian. This is a very comprehensive alternative to N-Central. It includes a number of features that make it ideal for MSPs. If you are looking for an N-Central alternative to operate an in-house IT services department, be aware that many small business users of SCCM report that it is a very complicated and time-consuming system to operate. So you should only consider this tool for your own on-premises support if you have a fairly large multi-site system with a team to support it. SCCM is a great option if your main task is to monitor the operating systems and software running on the computers and network devices on a client’s site. This involves configuration management for network equipment, software deployment for end-user nodes, and servers and patch management for that software, both for the operating system and user applications. Some interesting features of SCCM, which take it beyond a straightforward patch management system are its ability to interact with firewall and antivirus software and license management capabilities. Laptops and user-owned devices can create headaches for systems administrators and SCCM has a great way of detecting roaming devices that appear from site to site. This is a typical scenario often experienced by corporate HQ staff who frequently use other sites for meetings and projects. SCCM is able to containerize corporate apps on user-owned devices and create software access management points around the client’s sites. These points enable patch management to continue while a device is on another site while maintaining policy monitoring tied to the device’s registered home base. The policy formulation and enforcement features that you can deploy with SCCM make this package a particularly good choice for MSPs. These policy-related functions are also available separately with the Microsoft Policy Platform. User permissions are managed through Microsoft’s favored Active Directory authentication system. As SCCM employs many Microsoft components, it is much better at managing remote endpoints that use the Windows operating system than any other OS. This software is not free, but you can assess SCCM on a 180-day free trial. ConnectWise Automate is a network management system that includes a number of remote administrations features. These RMM characteristics make this software great as an N-Central alternative for MSPs. You can operate system monitoring and alerting, patch management, remote control, scripting and asset management through the tool. The name of this tool shows that its creators particularly wanted to provide a system that is very comprehensively driven by scripts. The automation level of the asset management system can be set on install and can also be enhanced further through a scripting module that lets you create your own automated workflows. 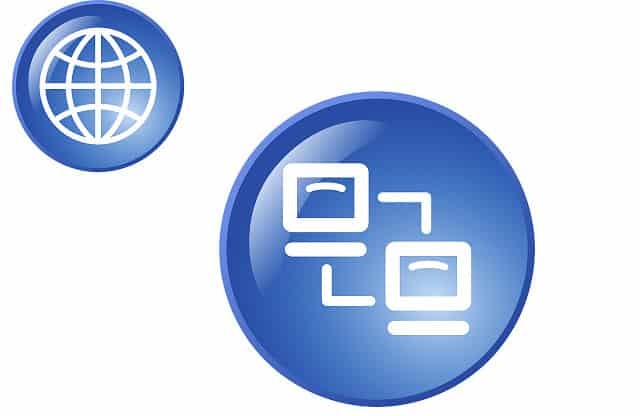 The remote access module of ConnectWise Automate is called Screen Connect and it is a great way for Help Desk technicians to fix problems on individual client computers. So, the blend of the scripting language and the ad-hoc manual access provided by Screen Connect means you can cover the whole spectrum of customer support functions with this tool. The range of services provided by ConnectWise Automate also gives the tool a very wide client base. It is suitable for remote services conducted by an individual operator, such as training and one-on-one support; it can also cater to MSPs with a large number of clients. Onboarding can be performed remotely by email invite if you need to support a widely-dispersed home-based team, or you can apply group policies, to manage large numbers of similar machines on a site automatically en masse. Access to the ConnectWise Automate is delivered on the Software-as-a-Service model from the Cloud, which makes it easy to add on new technical staff and onboard new clients. The service is completely scalable. You can get ConnectWise Automate on a 14-day free trial. The sales team are happy to extend that trial period up to a month on request. However, ultimately this is a paid service. Pulseway is a Cloud-based network management system that has features that attract MSPs. The scalability of this tool and its per-workstation subscription pricing model makes it very easy to expand the service as you acquire new clients. The mid-market for RMM software is very crowded at the moment and you may find it difficult to tell a number of the services on this list apart. Pulseway is a very similar prospect to both ConnectWise Automate and Kaseya VSA (below), so in all three cases, you will need to assess each option on their free trial offers. Like ConnectWise Automate, the Pulseway solution for MSPs is not free, but you can get it on a free trial. The company also offers a version of the Pulseway network monitoring system for free to very small businesses. The free Pulseway only allows one user account and gives you the ability to manage just two endpoints. The full Team version is also available as on-premises software. Pulseway offers a base subscription package to MSPs that provides all of the RMM functions that you will need to support your clients. On top of the standard RMM there is an extensive array of add-ons available to enhance the system and cover all of your client interactions and in-house systems. The online Pulseway Dashboard gives access to remote Desktop control, OS patch management, software deployment, update management, and application monitoring. The tools embedded in the Dashboard provide advanced automation, operative monitoring, customer SLA reporting, and custom management information reporting tools. Teams get multiple logins and group account functions that let you adapt the Dashboard per employee role. You can also adjust system monitoring alert settings and direct those service alerts to different team members by email. You can also allocate automated workflows that get triggered by specific events detected on the networks of your clients. Additional modules available from Pulseway include Web server protection, antivirus protection, a Cloud data backup service, and a PSA module. Kaseya VSA is the third in our choice of mid-market scalable MSP support platforms that excel at task automation. Kaseya also has a remote control module, called Live Connect, so you can implement bulk updates and also give each endpoint one-to-one attention. As an MSP, you have to get automated network monitoring with built-in alerts, patch management, and service auditing in your support platform. Those are the features that N-Central provides and they are also standard with Kaseya VSA. A key feature that Kaseya VSA offers is a module that is called AssetIQ. This is a contextual documentation management system and it is easy to see how this could lighten the burden of an MSP. The documentation system could work as a substitute for manned Help Desks, or could be structured as script for Help Desk operatives to work through a problem and direct problems to back office staff. If linked to a workflow, the documentation base could also provide a guide to fix strategies if you want human attendance for a specific category of problems. So the guided documentation option gives you a middle path between total problem resolution automation and personal contact. A couple of other nice features, including AV and backup integration will enable you to integrate added value features to your charge sheet. Whether you are setting up an inhouse network operation center or offering third-party MSP work, you will be able to cover all of your system requirements with Kaseya VSA. The only difficulty you will have is distinguishing between this and the service’s main competitors, which are listed in this guide. The company offers a 14-day free trial so that you can become familiar with the Kaseya VSA utilities. When you consider an N-Central replacement, you also need to look at the boundaries of RMM definition. It is difficult to work out whether a specific tool will fit into the role that N-Central could fulfil without considering all of the related services than an MSP needs. If you just narrow your search to straightforward patch management and remote access systems, then the pool of alternatives expands into a lake. However, a great benefit of buying a tool from a comprehensive system provider is that it offers companion products that exchange data with the tool under consideration. Could you run an MSP with a standalone RMM? No, you couldn’t, so there is no point considering the best RMM in the world if it: doesn’t exchange data with your Help Desk system, doesn’t have a related PSA, and can’t be integrated into an SLA compliance and billing system. This review is limited to ten N-Central alternatives to save you time. You may wonder why some of the very excellent management tools that you may have heard others rave about do not appear on this list. Particularly, you may have heard about Zabbix and Icinga 2. These two tools are very, very close to Nagios and it seems unfair to include Zabbix and Icinga 2 while including Nagios. When deciding on tools to include on this list, the need was to present options that were unique. Zabbix is a good option, but Nagios is the leader in the open source network monitoring category and it has plugins available that tailor it better to MSP usage than Zabbix. Icinga 2 is a direct clone of Nagios. So, all of the plugins available for Nagios will also work with that network management options. However, in the interests of brevity, all of the Nagios clones are truncated into one entry. Like Nagios, Zabbix, and Icinga 2, Kaseya VSA, Pulseway, and ConnectWise Automate are very similar products. However, each has a focus that makes it more appropriate for a different audience. The Kaseya VSA approach to intelligent documentation management could be regarded as an automated self-service solution that an MSP could set up and run as an ongoing front end to a standard remote network monitoring and patch management system. The scripting capabilities of ConnectWise Automate make it a truly unique tool for MSPs that want to replace as many staff as they can. Pulseway is a rising star that has a very loyal following, and so needed to be included in this list of the best N-Central alternatives simply because of its glowing review profile. If you are annoyed that N-Able’s N-Central is no longer available, you should be happy to discover that N-Central is now a SolarWinds product. SolarWinds is a very large organization and is able to provide much better technical support to its buyers than N-Able could ever afford. The SolarWinds re-write of N-Central made it compatible with the other MSP modules offered by the company and also brought in interoperability with the wider SolarWinds stable of specialist asset management tools. You can see from our list that you do not have to limit your options to paid services. There are many open source, free MSP support systems out there. However, never lose sight of the fact that you get what you pay for and if your business relies on providing excellence in IT services, you really can’t afford to risk cutting corners for the sake of budget squeezes. Do you run an MSP? Are you one of the thousands of entrepreneurs around the world that has turned IT skills into a home-based management service? Which RMM package do you prefer? Leave a message in the Comments section below to share your experience with the community. Have you tried ThreatLocker? It’s really easy to use and quick to setup. It also allows application whitelisting and storage control. Am using comodo one RMM solution for my business..! It really works very well and monitor clients endpoints and networks efficiently.